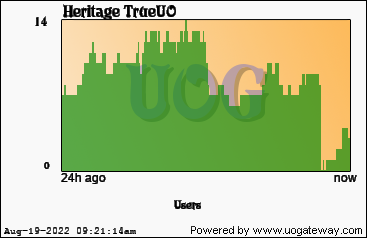 Heritage - Up and running for 640 days as of 10/26/2017. A UO clone all the expansions. Newest content to include: - Full Enhanced Client and Classic Client support. - FULL TOL SUPPORT. ALL skill masteries. - Shadowguard! The newest TOL encounter. - Virtue vs Vice (VvV)(Newest UO PVP system) - Clean Up Britannia - Town Loyalty / Governorship - Bard and Skill Masteries (new TOL expansion) - Covetous Void pool encounter - Shame Crystal and boss system - High seas 100% - Imbue / Reforge - Castle Blackthorn Dungeon - Custom content and a balanced economy. Dedicated Server - 24/7 99.9% uptime. We run this shard on a base set of values and ethics and you WILL see it. LOYALTY, DUTY, RESPECT, HONOR, and most importantly INTEGRITY! Stats last updated 297 seconds(s) ago using 187995 data samples.